What does E 22 error code mean? Most often, the icon E 22 is displayed before the end of the cycle. The machine completes the wash, but it stops before draining the water and signals a malfunction. 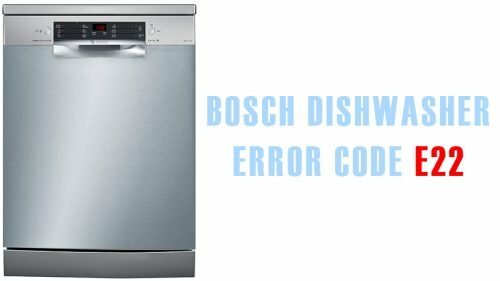 But if the problem really exists and some details in the dishwasher are damaged, then the code will appear again. We do not recommend restarting the Bosch dishwasher several times in a row. This may damage the electronic board. You noticed an error? It’s time to read and fix it. Drain filter. Food particles, sludge, glass shards – everything is washed off and retained by a mesh filter. It is clear that the waste water cannot get into the drain, so the system displays the error. Drain hose. If you notice that the code E22 alternates with code E24, and after checking it turned out that the filter is clean, then it is worth to inspect the hose. We will describe how to do that later. Sprayer issues. Food particles get into the bushing between the impeller and the pump. The sprayer stops working. If the error codes alternate each other, then the pump impeller does not rotate. A thread or some pieces of food wrapped around it can cause the malfunction and stop operation. The first thing to do is to inspect the dishwasher. Open the door, pull out all the racks from the tub. Remove the filter located at the bottom of the tub. Clean it from sludge, rinse the mesh under the running water. You can use a brush for cleaning. Check the location of the drain hose. If it is somewhere bent or kinked, then it is not surprising that the water does not drain and an error appears. See if the impeller rotates normally. If not, then remove it and clean bushing from the dirt. All of these manipulations did not help? The code is still there? Then you will need to look deeper. You might need to disassemble the dishwasher. Put an old blanket and a rag to turn the machine on its back. Unscrew the bolts around the perimeter of the bottom cover. Remove the leakage sensor bolt. Remove and set the cover aside. You will have access to the inside of the dishwasher. Disconnect the drain hose from the pump. Use the pliers to do this. Inspect the hose for clogs, rinse it under water. If the hose is damaged or worn, install the new one. Pay attention to choosing the right replacement parts. Choose only the components designed for your Bosch dishwasher model; otherwise the purchased item may not be a good fit.